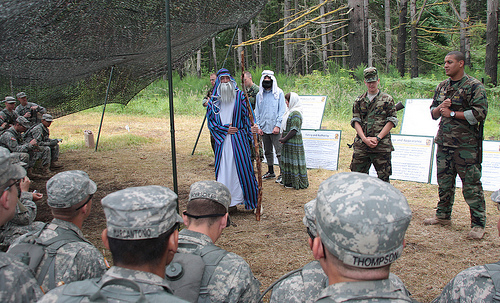 JOINT BASE LEWIS-McCHORD, Wash. – Practical training in the U.S. Army is crucial. The situations within the training may be extreme, but at the Leader Development and Assessment Course (LDAC), preparedness is one of the most important aspects of Soldier combat-readiness. Cadets attending LDAC are subjected to a made-up Atropian culture. This culture is meant to resemble, but not mirror, a culture they are likely to encounter in Middle Eastern and Southwest Asian countries. Through several different stations which make up the Cultural Awareness training site, Cadets build confidence in their ability to communicate with foreigners and in their ability to operate as a squad. 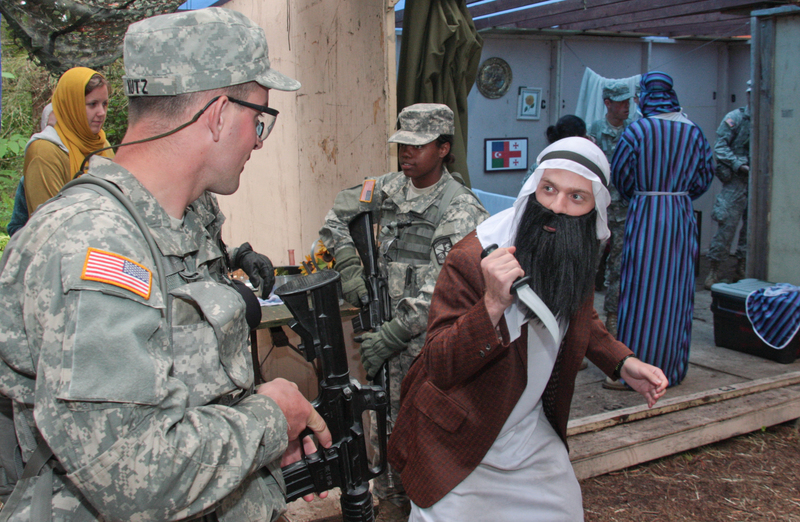 The Cultural Awareness training puts Cadets into a situation where they often face stubborn Atropian-natives who have little patience for U.S. Army officers. Cadets do not go into the situations blind, however. Before Cadets enter the scenarios they have an opportunity to learn about Atropian culture by asking questions of the trained 2nd Lt. actors. In turn, the actors ask the Cadets about American culture in order to break down any cultural biases. Once introduced to the “natives,” squad leaders must assign Cadets to assume roles such as public affairs officer and interpreter. Those Spanish courses in high school won’t help Cadets here, though. The Atropian forces are stubborn with Americans, especially in situations where a man is forced to dig his own grave or an Atropian Soldier hoards artillery munitions in his truck. Experienced military leaders, such as Negin and Col. Dean Shultis, Commandant of Cadets at LDAC, say the training is practical and important for these soon-to-be Army Officers. Negin has seen thousands of Cadets make their way through his course. “It’s a very useful tool to help [Soldiers] get the mission done and enable them to get along with other people,” he said. importance of understanding language, religion, history, politics and ethnic tension within another country’s culture, even if only a little bit. Shultis spent all of his overseas time in the Middle East and took a semester of Arabic while at the National War College where he learned modern standard Arabic as well as important aspects of Arab culture. He has seen first-hand the importance of cultural awareness amongst Soldiers. Watch our video on Cultural Awareness here! The Leader Development and Assessment Course, also known as Operation Warrior Forge, is the capstone exercise on the way to becoming a U.S. Army lieutenant.